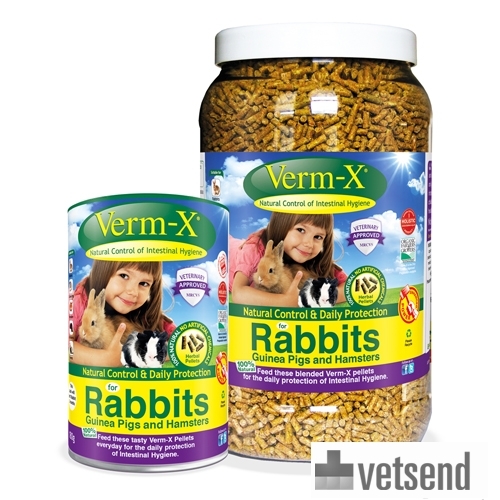 Verm-X pellets for rabbits, guinea pigs and other rodents is a herbal preparation to care for and maintain optimal intestinal condition. It is Verm-X's mission to make sure that animals stat healthy and that they have and keep optimal intestinal health and hygiene. Verm-X started with products for horses in 2002. In collaboration with some of the most renowned naturopathic physicians Paddocks Farm Partnership started producing a healthy herbal preparation. This day, the Verm-X range includes successful product for horses, cows, chickens, dogs, cats, rabbits, and rodents, sheep and goats, pigs, aviary birds, racing pigeons, game birds, reptiles and llamas and alpacas. Despite the fact that most rabbits, guinea pigs and other rodents are mainly kept indoors, they are still at risk of intestinal infection. Verm-X pellets for rodents are carefully composed of 100% natural herbs. They encourage good digestion, are very tasty and contain a high percentage of fibre. The pellets contain alfalfa, grains & molasses and are shaped to encourage gnawing which is good for the teeth. Furthermore, healthy intestinal flora also means a healthy immune system. Quassia, cayenne, fennel, cleavers, nettle, slippery elm, garlic, peppermint, thyme, cinnamon, alfalfa, wheat, molasses, prebiotic (Bio-Mos: a dead yeast Saccharomyces cerevisiae), probiotic (Toyocerin) and soya oil. After opening, store in a cool, dry place. Use by best before date shown. Please note: this product cannot be compared with a regular worming treatment. If you do want to use Verm-X to replace a regular worming treatment, please have your veterinarian carry out regular faecal examinations. Have you used Verm-X for Rabbits and Rodents before? Let us know what you think about this product.